Hochiki Europe – the manufacturer of life safety solutions – will be on Stand D100 at this year’s FIREX International (which runs from 20-22 June at London’s ExCeL), offering expert insight on key industry issues and showcasing an extensive range of its systems. The company will be giving visitors live product demonstrations and guidance on how to select the right life safety system for specific environments. Visitors will also be introduced to Hochiki Europe’s new water detection system, LEAKalarm, as well as its analogue addressable life safety platform designated L@titude. L@titude helps customers quickly locate and examine incidents occurring across premises in real time and from any location. The platform enables customers to create a fully customisable life safety system thanks to addressable loop detection circuits, conventional detection circuits, relay cards and additional sounder outputs. Alongside a new conventional detector and an EN54-23 approved base sounder beacon, the next generation of ESP intelligent sensors will also be on display. These new sensors feature an integral short-circuit isolator (SCI) in the sensor itself, negating the need for SCI mounting bases. Hochiki Europe’s extensive FIREscape family of emergency lighting solutions will also be showcased with working demonstrations at the event, including the new FIREscape lite stand-alone kits and the combined fire detection and emergency lighting system FIREscape+. Stand D100 will feature a selection of specialist application equipment including intrinsically safe and SIL2-approved flame detectors, beam detectors and aspirating systems, as well as linear heat detection. In addition to product displays, Hochiki Europe’s stand will offer a presentation area where educational seminars will take place throughout the show. Topics for discussion will include the recent revisions to emergency lighting legislation, as well as overviews of the latest life safety technologies available and how they can be applied in different environments. The Hochiki Europe team will be on hand throughout the show to offer guidance on the best use of each technology. Visitors are encouraged to speak with Hochiki Europe’s experts for application advice. A new study conducted by Hochiki Europe has delivered a stark warning to the fire safety industry, with the company’s research finding that nearly half (49%) of European fire safety equipment installers are not familiar with the latest fire and emergency lighting legislation. 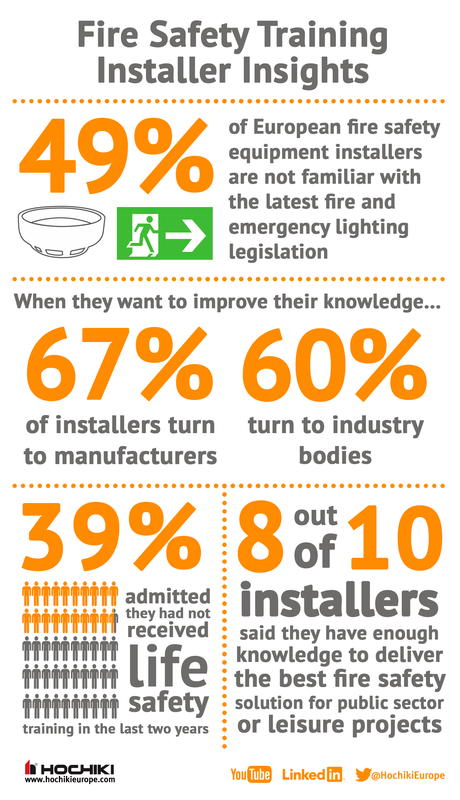 According to the survey of European fire equipment installers, over two thirds (67%) are looking to manufacturers specifically to improve their knowledge on fire and lighting safety legislation. This is closely followed by industry bodies, with 60% of respondents stating that they turn to professional associations in order to learn about the latest legislation. Nearly two-fifths (39%) of respondents admitted they had not received any fire or emergency lighting training in the last two years, yet 90% of installers felt that their clients would benefit from them receiving more training. Of those that had received training, 75% felt either confident or very confident in understanding different types of fire safety technology and recommending (and designing) a fire safety solution. The study also examined confidence within key industry sectors, and revealed that eight out of ten (83%) installers feel they have enough knowledge to deliver the best fire safety solution for public sector or leisure projects. Conversely, less than a fifth (18%) said they felt this way about offshore environments: a key growth sector they could be missing out on through lack of knowledge. According to Government figures, the UK’s Fire and Rescue Services have attended nearly a quarter of a million false alarm incidents throughout the last two years, with the majority caused by faulty fire system apparatus. Yet maintaining thorough records of testing and maintenance of a property’s fire safety system has been a legal obligation for domestic premises and houses with multiple occupants in England and Wales since the Regulatory Reform Fire Safety Order 2005 (RRFSO) was introduced. 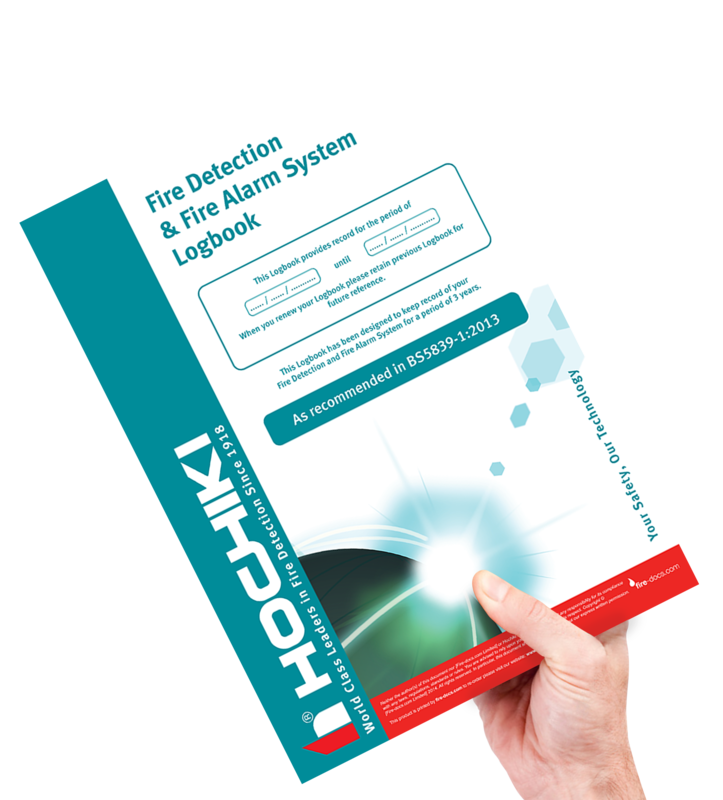 In response, Hochiki Europe has launched “the industry’s most comprehensive fire system logbook” for its customers. The new logbooks provide guidance in line with the UK’s most recent legislation to help those responsible for the upkeep of fire safety systems to accurately record false alarms as well as required maintenance and testing processes, in turn ensuring compliance. 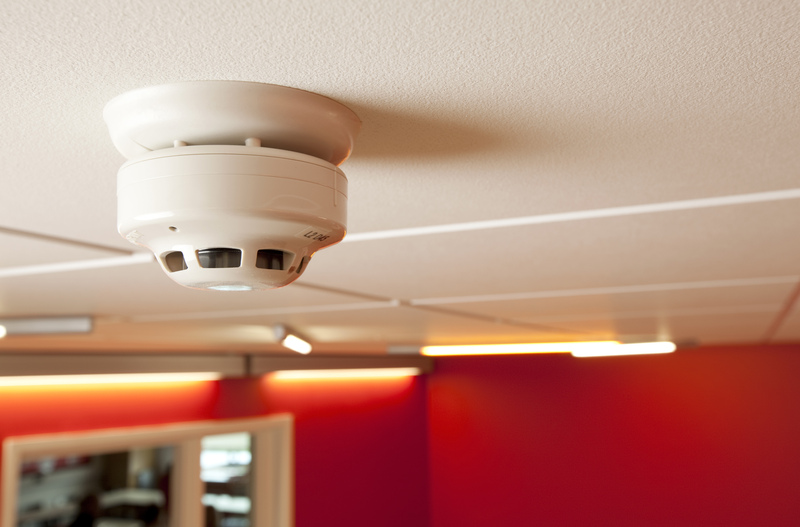 The RRFSO is supported by BS 5839, a Code of Practice published by BSI which recommends any owner of a fire detection system records all system events in a suitable logbook. Hochiki Europe’s new logbooks have been compiled by a team of BAFE consultants. The logbooks allow customers to monitor system activity, abide by UK legislation and have their records to hand in the event of a Health and Safety audit. The A4 logbooks contain 36 pages of fire system-related forms and checklists in which end users can record false alarms, tests and maintenance work, panel access codes and battery capacity. The new logbooks also provide written guidance for users around their responsibilities when facing false alarms, changes to the building, routine system attention, pre-alarms and recommendations on how to properly investigate fire safety systems.